A "ministry" in the church is how things get done and how ideas take shape. As a visitor, or as a member of Epiphany, you don't need to take on any task, but many parishioners enjoy offering service to God in worship as well as building friendships with other parishioners in Outreach and other areas. There are many options and new paths of service are opening up all the time. Speak with any of the Clergy or Staff about these ministries. The first people you meet each Sunday are the greeters and ushers. These volunteers help members and visitors feel comfortable and are great resources if you have questions. The service begins when the acolytes light the candles. Our young acolytes demonstrate that all ages are welcome and participate in worship! The Altar Guild takes responsibility for the care of the altar and items used in worship. 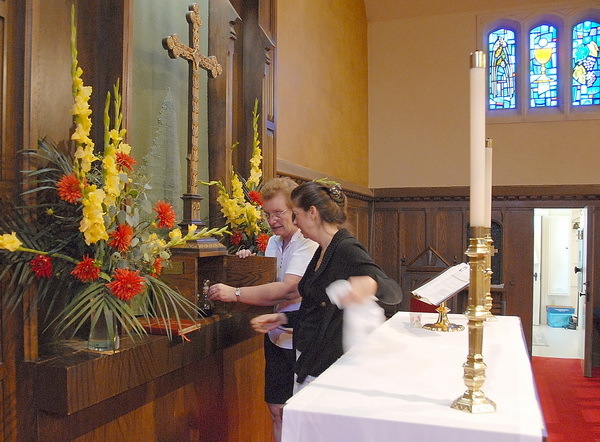 They order the flowers and care for the altar linens, silver and other beautiful components used in the service. It is often said that when two or three are gathered at Epiphany, there will be (wonderful) food! The Hospitality team helps out at parish events such as coffee hours, potluck suppers and special gatherings. One or two parish individuals or families also sign up each week to host Coffee Hour after the 10am service. “Liturgy” means “work of the people” so many lay members of the parish assist the clergy as, together, we worship God. Lay ministers help read scripture lessons and offer Communion at the altar as well as taking Communion to the sick and homebound. Our choirs and musicians help us raise our voices in prayerful song.